The global nurse call systems market is expected to experience a significant growth in future years owing to rise in old age people all across the globe. According to analysis of the market opportunity, the global nurse call systems market is exceedingly focused and broadened because of the emergence of several large and small organizations. Likewise, to build their market size and market shares, these vendors are creating nurse call systems with integrated wired technology or wired technology. Additionally, the vendors go against each other owing to various factors, for example, product differentiation, aggressive pricing, capital support for product or technology upgrades, and distribution partnerships to improve their position in the market. Cornell Communications, Azure Healthcare Ltd., Hill-Rom Holdings, Inc., TekTone Sound & Signal Mfg., Inc., Ascom Holding AG, Tyco SimplexGrinnell, Rauland-Borg Corporation, STANLEY Healthcare, Jeron Electronic Systems, Inc., and Vigil Health Solutions, Inc. are among the key players leading the global nurse call systems market. According to a report by Transparency Market Research (TMR), the demand in the global nurse call systems market is anticipated to grow at a noteworthy CAGR of 10.9%within the forecast period from 2017 to 2025, evaluating it to achieve a valuation of US$2,665.98 mn by the end of 2025. The majority of the leading players are depending on recent innovations with a specific end goal to separate themselves from the competitors and lead in market share. The report additionally expects offering of customized facilities as indicated by the necessities of particular hospital, acquisitions of promising players, new product launch, and notable contract wins as some more alternate methodologies of the key players to grow their revenue in the market. 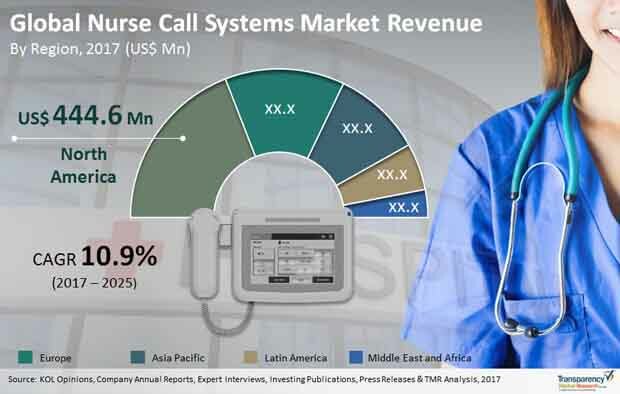 The IP-based nurse call systems market held the maximum shares due to highest demand, in 2016. The segment led the others owing to its property of flexibility while installation. Additionally, the demand for the segment is anticipated to keep on growing within the forecast period as well. Azure healthcare Ltd. got an order of worth US$1.1 mn from healthcare center in North America, in August 2016 for IP-based nurse call systems ‘Tacera’. Geographically, North America region led the market in 2016, because of rise in geriatric population and assisted healthcare homes. This region is expected to sustain its leading position in coming years as well. Rise in healthcare expenses, particularly in the developed nations, increasing popularity of medical insurance in various developing economies, prevalence of chronic infections, increase in old age population over the world, increased investment in healthcare industry, technological headways and product upgradation, government bolster for advanced innovation that helps in consumers’ care progressively, and convenient availability of information for essential healthcare departments are a some of the essential drivers propelling the global nurse call systems market. Upcoming technologies, for example, integration of nurse call systems with cell phones and in-in-hospital remote telephones, centralized nurse call system, interoperable designs, and expanding nurse contribution in healthcare sector are among the major reasons that are anticipated to surge up the global growth of nurse call systems market. Then again, factors, for example, increased expenses of implementation, challenges relating to interoperability and integration, strict government regulations, and the lack of skilled professionals who can work productively with IT and healthcare are obstructing the market for nurse call systems from accomplishing its actual potential. Rise in healthcare expenses, particularly in the developed nations, increasing popularity of medical insurance in various developing economies, and prevalence of chronic infections, are some of the essential drivers propelling the global nurse call systems market. Increase in old age population over the world, increased investment in healthcare industry, technological headways and product upgradation, and convenient availability of information for essential healthcare departments are some of the essential drivers propelling the global nurse call systems market.